Traveling with an RV is a special kind of adventure! You just sit in your car and drive, visiting distant places, far away from the crowded city, and sleeping under the open sky while enjoying the sounds of nature. Many people like to go even further, visiting distant locations such as lonely mountains covered in deep snow. There are only a few things that can measure with that peaceful moment when you’re drinking a cup of hot coffee or tea in the winter on your nature vacation. However, while you can easily prepare a hot drink or a meal for yourself, you also need to keep your RV at a comfortable temperature so you can feel comfy after a long day of hiking and exploring the nature. This propane-powered device is one of the most popular options on the market. You can use it both indoor and outdoor, like a heater in your RV or a campfire for you and your friends in long camping nights. It’ll provide a cozy feeling and make your traveling enjoyable along the way. Mr. Heater produces from 4000 to 18000 BTU and it’s suitable for spaces that have up to 450 square feet. It offers three heat settings that you can adjust at your personal preference. The unit can raise the temperature up to 70 °F even in the coldest weather conditions. While it needs around 10 to 20 minutes to heat the entire 400 square feet, it can heat smaller areas in no time. It also connects to the 20-pound propane tank and can work for two weeks without any need for a refill. However, keep in mind that the medium heat setting doesn’t burn cleanly, and the output air smells of propane. Kind reminder: Don’t fall asleep while the propane heater is still working. Almost all newly designed products have an automatic turn-off but you should still be careful. It comes in 18.5 x 18 x 11.4 inches and it weighs around 17.5 pounds. The unit has a handle located on the top of the unit for better portability and easy storage. The outer part is made from heavy-duty metal and plastic, so you don’t have to worry about transportation bumps damaging your device. It has an auto shut-off that goes off when the device is tipped over and when the pilot light goes out. It’ll also turn off if it detects low oxygen levels. Additionally, Mr. Heater has a thick wire cage over the front side that keeps the inner parts safe from any outside object that can damage it. This feature also protects you from accidentally burning yourself on it. We came to the best part of the review – this great portable option has a great price. If you need a compactly designed unit that can be easily moved around, and yet be powerful enough to maintain comfortable room temperature, Big Buddy is a perfect choice! 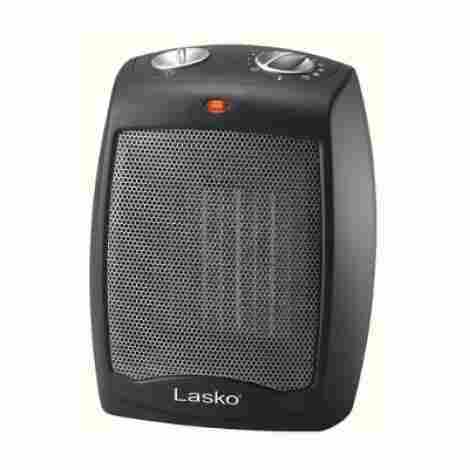 Here we have Lasko’s space heater that can be used for warming your vehicle, garage, house etc. The product comes with some really good features, such as the ones that allow you to adjust the heating so it fits your personal needs. You also get a remote control for absolute comfort and user-friendly experience, not to mention that it comes fully assembled, ready to use right from the box. The unit has 7.4 x 8.7 x 23.5 inches and weighs 6.95 pounds. It has a power of 1500 watts and it comes with a multi-function remote control. There’s a wide range of settings that allow you to adjust the temperature at your own will. You can adjust it in accordance with 2 heat settings – high heat and low heat. Lasko goes from approximately 60 to 85 °F which is quite impressive for a compact option. It also has a widespread oscillation that distributes warm air throughout the room and thermostat control that allows you to put the device on the auto option (it has a 7 hours timer). However, keep in mind that this can use a lot of energy if you leave it to run all the time. One of the best things about this product is its portability. You can use it in the RV when you’re on the road, as well as for home and outdoor purposes. It has some desired safety features such as elongated ceramic element and penetrating air velocity that will provide safe heating wherever you are. The overheating protection ensures that it doesn’t overheat even if you forget about it for an extended period of time. Additionally, this product has a well-made exterior that stays cool to the touch even after several hours of heating. This versatile and ergonomically designed product can be yours easily because it costs next to nothing! You can light up your camping days and nights, and always feel comfortable near this product! If you’re searching for a compact portable option that you can use in your RV traveling adventures, this product from Lasko might be a perfect choice for you! 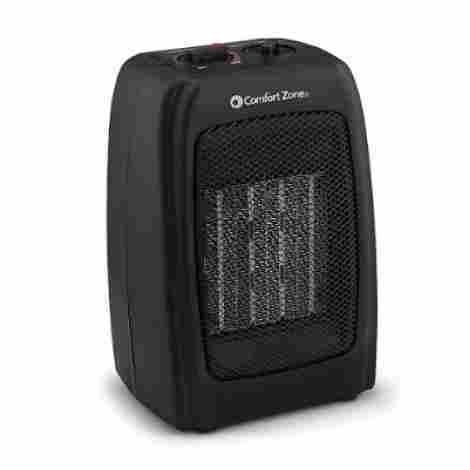 This is great for smaller vehicles, rooms, and offices but it can also heat big areas. Keep reading if you want to find out great features that make Lasko CD09250 one of the most popular options on the market. This product can produce up to 1500 watts of power when you set it on high and 900 watts when you set it on low power option. The thermostat gives you control over the heating options so you can fully adjust the unit to fit your personal needs. Lasko needs approximately 5 minutes to fully warm up the entire room. However, don't forget that this is a compactly designed option that works perfectly in small to medium-sized areas, but it can only work as an additional heater for big rooms. You can use this Lasko unit wherever you want due to its size. It measures 9 x 7 x 5.7 inches and weighs 3.5 pounds. The adjustable controls are located on the top of the unit, and there’s a handle at the back for easier carrying. When it comes to safety features, the unit has an overheat protection that makes it safe even after several hours of heating. The device will shut itself down automatically when it reaches the temperature you’ve previously set, and turn on again when the temperature drops. We only noticed the lack of oscillation feature with this product. This high-quality and compactly designed option is also well-priced. It comes with a 3-year warranty and great customer service that will help you if you run into any issues. If you need an option that’s big enough to warm up a large RV, we have just the thing! The Dr. Infrared has serious power that can warm up big-sized rooms. You’ll love its versatile features and excellent performance! Dr. Infrared can warm up an area up to 1000 square feet big! The integrated infrared quartz tube ensures more heat with less energy. You’ll be snug in your RV feeling comfortable and relaxed after a day full of outdoor activities thanks to this that has 52,000 BTU. The unit has a feature that you’ll absolutely love – a humidifier. This feature creates a gentle mist so the air doesn’t become dry and uncomfortable. This product also has an oscillating fan that works quietly so you can read or sleep undisturbed. This has 4 wheels for more portability and an overheat protection as a safety feature. It’s a bit easier to tip it over because of the wheels, but if you want it to be more stable you can use the wheels only for transportation and take them off during use. Another useful feature is a removable filter that makes the cleaning process easy as it can be. You can just remove it from the unit, clean it with a vacuum or with some soap and water, and put it back in. Just don’t forget to dry the filter before you put it back in its place. Lastly, you should know that all the features can use a lot of electricity if you let them operate simultaneously. The Dr. Infrared unit is pricey compared to previously reviewed products, but when we take into account its many features and output power, we have to conclude that it’s worth every penny. It’s really hard to beat this option in terms of heat emission and overall quality. 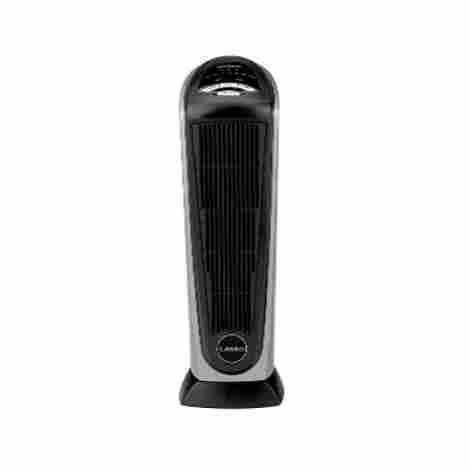 Here we have another Lasko product that has great performance and compact design. This versatile device offers many adjustable options and high-quality features, so keep reading to find out what distinguishes this from the competition! This Lasko option has 1500 watts of power and it plugs in a regular output. You have an ability to adjust the heat at your personal preference using a digital display. You can choose whatever temperature you want, and you have 2 quiet settings too (high and low). The product has a widespread oscillation that can distribute warm air throughout the entire room area. It comes with a remote control that allows you to adjust the temperature, timer, oscillation and other features from a distance for a full comfortable feeling. However, there is one possible issue that you could find quite annoying – some users complained about the thermostat not being as accurate as it should be on the shut-off operation. This has an overheat protection and a cool touch exterior – the first feature prevents the damage that can be done to the device itself while the second feature keeps you without burns and allows you to move it freely across the room while being turned on. The unit has 23.6 x 8.6 x 7.6 inches and 8.75 pounds, and these dimensions make it very portable and suitable for any storage place. There is also a convenient built-in handle for simple carrying. Lastly, this Lasko product comes fully assembled, and you can use it right from the box! The only thing that could bother you is some kind of a plastic smell, but it fades after a couple of days. This high-quality product will warm up your RV in no time, providing you a comfortable feeling during long winter nights. As if that was not enough, it will also be easy on your pocketbook! Camco is a well-known manufacturer that first started with heater production in 1966, and 53 years later there is a wide range of Camco’s products that offer high quality and excellent performance. The Olympian Wave is the most popular Camco product on the market. It will warm up your RV in a few minutes, providing a comfortable and enjoyable vacation. 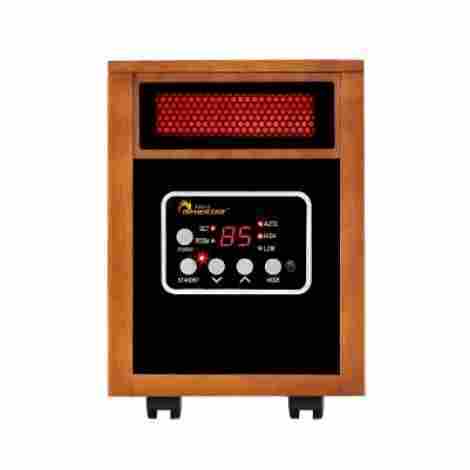 This product offers 8000 BTU – it can warm up 290 square feet and you can adjust the heating according to your needs. Camco works differently than previously reviewed options because of its ability to radiate heat to objects, floors, and walls rather than heating up the air. This way, you’ll feel the warmth almost immediately and you can even turn it to the specific area you want to heat just as a flashlight. This operates on low-pressure propane gas and it can be hung on the wall or also used as a portable unit. It utilizes safe and clean HD-5 propane gas. The lack of cables and batteries makes it the best option for camping. It’s also a very silent option that doesn’t emit any annoying noise. When it comes to safety features, the Camco is has a safety shut-off valve. The one thing that you’ll certainly miss is the thermostatic control, even if you can adjust the heat level. Camco offers excellent heating power for your RV, but like other gas options, it’s quite expensive. You won’t be needing any additional heating sources though. Also, Camco provides a 1-year warranty in case you run into any issues with the product. DeLonghi is an internationally known manufacturer that produces household small appliances. Here we have its oil-filled radiator that you can use to warm up your room, bathroom, garage or use it in your RV during winter and cold days. It’s not as portable as extra small options, but it provides more power and therefore comfortable warmth when you need it! DeLonghi has 1500 watts of heating power and it operates silently, so you won’t be annoyed by its presence. It simply plugs into the power socket and never needs refilling as it has a permanently sealed oil reservoir. By pressing the ComforTemp button, it automatically maintains the optimal room temperature. There is also an adjustable thermostat and three different heat settings. People only complain about not knowing the exact room temperature when the unit is on. It would be nice if it had a display that would show the current room temperature. This unit measures 5.9 x 13.8 x 24.9 inches and it weighs 23.7 pounds. It’s not as lightweight as other options that can be carried in one hand, but it offers more power. The only issue with this product is the fact that it isn’t as portable because of the short cord. If you want a product that you can carry around wherever you go, this might not be the best choice. However, if you want more heating power, you can easily purchase an extension cord. Lastly, it’s worth mentioning that the unit has a safe cut-off option for overheating prevention. Not only that DeLonghi will save you some money by maintaining the optimal room temperature, but you can also get it at a reasonable price. You can cut your electric bills in half with this and safely use it on your every trip. If you’re searching for a compactly designed option that still offers a lot of power, you can’t go wrong with Bovado! This small device offers surprisingly high heating power, and it can warm up a small to medium-sized RV in no time. Bovado is a versatile and portable device that you can use for heating up entire apartments as well as for outdoor heating purposes. The product has 1500 watts of heating power and it offers 3 settings: high heat, low heat, and fan. It also has an adjustable thermostat, so you’ll be able to set the device according to your needs. The Bovado comes with 6 inches power cord and plugs in a regular household power socket. The sound of the working unit will probably bother you at first, but most users get used to it after a couple of days. This is a compactly designed device that can be easily carried around and transported. It measures 10 x 6 x 6 inches and it weighs only 2.85 pounds. You will be surprised by how lightweight and small this is. It has a carrying handle, although it’s a bit awkwardly placed on the unit. Many users had an issue with frequent dropping the unit because of this. There are an overheating protection system and a safety switch that turns the device off if you accidentally tip it over. Lastly, it comes fully assembled so you can use it as soon as you unpack it. The Bovado is a real steal! It’s easy on your pocketbook while performing perfectly in small to medium-sized areas. True North is a perfect choice for those who are searching for a small option that can serve as an additional heating device. 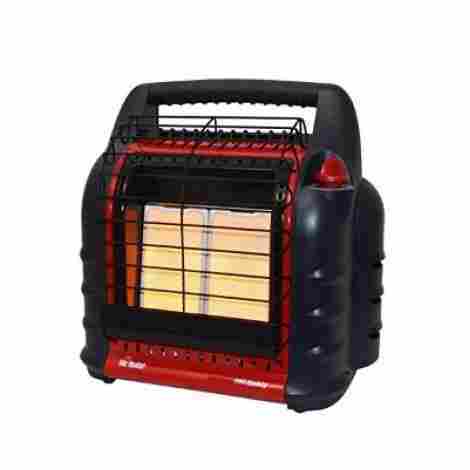 This is ideal for cold months in your RV but it can be used for house heating and outdoor purposes as well. Keep reading if you’re interested in what quality features this compact option can offer! Caframo offers 1500 watts of heating power. You can change the temperature between three heat settings: low (600-watts), medium (900-watts) and high (1500-watts). It also has 2 fan speeds. You’ll be comfortably snug in your RV with all these adjustable options that ensure the ultimate comfortable feeling during long winter days. The device operates silently, without any annoying noises. Let’s not forget that this has an anti-freeze setting – it will turn on automatically when the temperature drops to 38° F.
The device measures 4.4 x 9.27 x 4.4 inches and it weighs only 5 pounds. It’s very portable and user-friendly, you can place it wherever you want – on the table, under the desk or a vehicle’s seat, or any other place. It has a solid steel construction that keeps it safe from falls and accidental bumps. There is also an overheat protection that keeps the unit undamaged during use. You should keep in mind that this won’t be good enough for warming up the entire big room or an entire large RV, it’s rather used as an additional option than the only heat source. This compactly designed product is also well-priced. As if that isn’t good enough, it comes with a limited 5-years warranty. If you need a compact ceramic space heater that will easily warm up your Rv, Opolar heater might be the right choice for you. It offers some great features and it’s very portable, you can easily carry it around, acting as an additional heating source at any place. 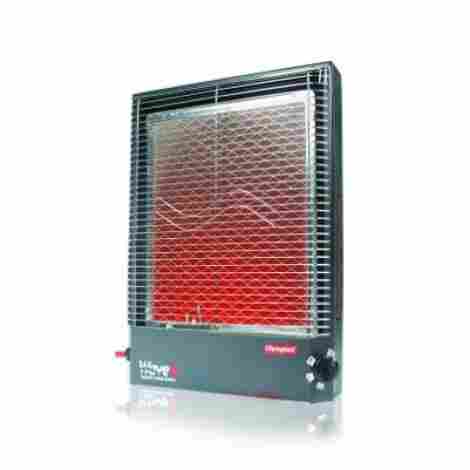 As we already said, the Opolar heater quickly warms up the area with 1500 watts of heating power. 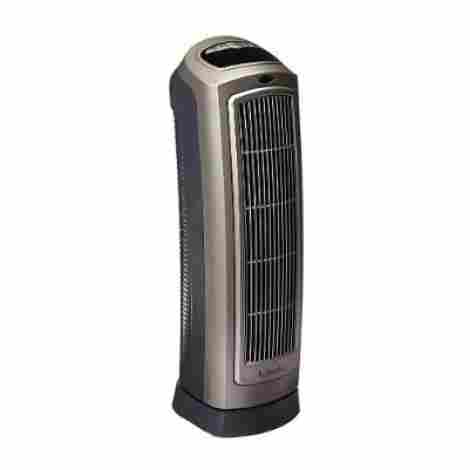 It has three adjustable settings: high heat (1500 watts), low heat (1000 watts) and a fan option. 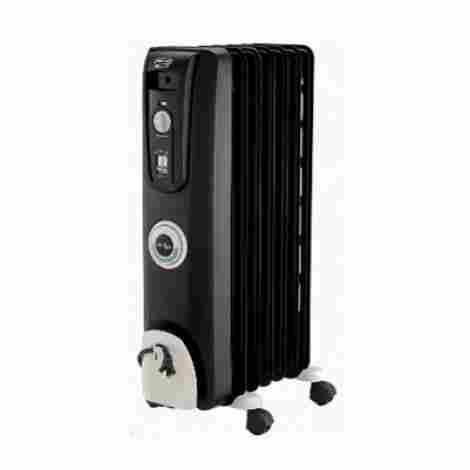 The heater has an adjustable thermostat that is able to consistently maintain the room’s temperature. Additionally, it will work quietly so you don’t have to turn it off if you need peace for reading or sleeping. The heater has 7.1 x 5.9 x 11.1 inches and it weighs only 3.5 pounds. It’s very portable and it has a convenient carrying handle. 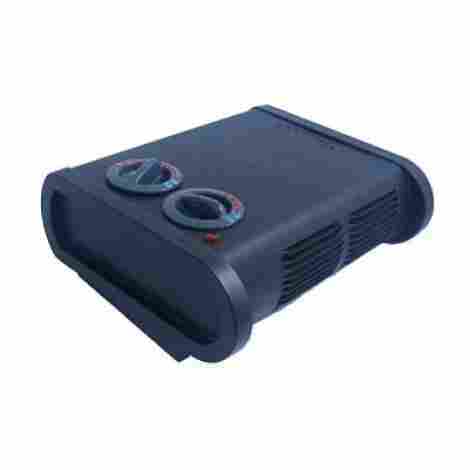 This heater is very small and easy to transport and place anywhere. When it comes to the safety features, Opolar has an automatic overheat system and the tip-over switch – both will turn the heater off to prevent damages. The drawback is the location of the tip-over switch – it’s located on the bottom of the unit so it can be triggered when the heater tips over. However, some users noticed that the button doesn’t work as well as it should on soft surfaces like carpets. This small yet powerful device has an attractive price and a 1-year warranty. It’s hard to beat Opolar in terms of compact design and heating power, so you can’t go wrong if you decide to purchase this little heater! Whether you need a compactly designed product or a bulky one that can warm up large areas, the heating power is very important. It’s important to know that your unit can produce enough heat whether it’s meant to be a main source of heat or it’s designed to work as a support heating device. Of course, if you’re buying a big option the output power is a crucial feature because you want to know that it can decently warm up a specific area. However, even the small devices can turn out to be quite powerful and they can quickly warm up an area. That’s why the heating power was an important factor in the evaluation process, but we had to look at the overall quality of every product because all of our picks have great performance. If you’re searching for a big unit you already know that some compromise with the design has to be made. Big options aren’t so portable as smaller sized ones that often have features like convenient handles for easy carrying. However, some improvement exists even among big options, and the ones that are made to be more portable (having wheels for example) are higher on our list. We also assigned some additional points to small yet powerful units because they are very portable and they can be used outside as well. We also looked for any additional features that provide more safety, durability, or a comfortable feeling with every unit. For example, it’s very useful when it has a cooling system that allows you to safely touch it even after several hours of continuous work. It’s also great when you can peacefully enjoy your evening near a silent device. These features and many other additional features were important factors in the evaluation of the best products. Some options are quite expensive while the others are surprisingly cheap compared to their overall quality. We had to take into account the value that every product provides for the money, and then rate them according to their performance. Do you need a unit that will only work in your RV or you need a multipurpose device? If you need one that will be only in your vehicle, you can choose a wall-mounted option, but if you need a portable device you should go with small units that you can easily carry around. Think about the size of the area you’ll be heating – this is essential! You have to know the exact size so you can buy a unit that can actually warm the area efficiently. You can purchase a perfectly operating product that can turn out to be too small or too big for your needs, even if it’s very powerful and well designed. We all want a powerful unit, whether it works as a main heating source or it’s only an additional device. However, if you don’t need too much power you can go with smaller options that have a decent output power and save a lot of energy. There are also big units with control features that prevent high energy consumption. When you determine what area you’ll be heating you can easily skip to this part – you’ll be able to determine the necessary heating power and all the rest. You should think about the features that you want for your device to have. There are some things that are not crucial for a heater, but they make your life easier. For example, some people want to have remote control or display that can show the room temperature at any given moment. Others don’t care about these features but they need a silent device that’s also portable. What are the features that you can’t go without and what are the ones that you can easily overlook? Q: Can I drive an RV during winter? A: Of course, you can! An RV can deal with snow as efficient as any other type of vehicle, you just need to prepare it properly before you hit the road. You should always have a set of snow chains – you shouldn’t forget to use them when you’re on the icy road. If you forget this important thing you might get into a situation to spend a lot of time off the road waiting for help. Also, you should have a full gas tank and maybe bring an extra tank just in case. You can easily get stranded in a winter storm, and you need a full tank to be able to go the long way to the nearest gas station. Lastly, drive carefully and slowly! An icy road can be quite tricky, especially for an RV, and in the end, winter vacation is all about enjoying snow and cold weather, so you don’t have a reason to rush through the storm. Q: How can I reduce the level of condensation in my RV? A: Condensation can be annoying and harmful – it can cause mold to grow, wood to rot and metallic parts to corrode. Therefore, you want to eliminate it from your RV as soon as possible. Luckily, there are a few simple steps that you can follow to defeat it. You can use a dehumidifier that pulls the moisture out of the air, or you can try with exhaust fans when you’re in the shower or cooking in the kitchen. That can help a lot! The best thing to do is to open the window although we are aware that is not always possible. The cold air will rapidly fill the room and cool it (don’t do this if it’s raining outside because that can cause condensation too). You should also avoid air-drying clothes in the inside and keeping your pots and pans open while cooking. Lastly, the condensation can be reduced by raising the room’s temperature. Q: How to keep my RV warm during the cold time? A: First thing first – trap the heat inside! Don’t let the heat escape, insulate windows and floors using thermal curtains and thick rugs. Covering windows is crucial because they steal the most heat, but you should let the sun in and cover them with curtains after sun fall. Keep your RV clear from condensation because it can drastically reduce the warmth. You can also do other things: sleep inside a thermal sleeping bag, cook and bake to make the stove active and keep yourself active as well. Think about all these simple things that may seem unimportant because they can really keep an RV warmer. Lastly, don’t forget to cover your vehicle during those cold winter nights!